Jalandhar: National body-building championship ‘MR India-13th Federation Cup’ concluded at LPU Campus amid a galore of championship activities. Participants from Punjab & Maharashtra got maximum of illustrious ranks during championship. 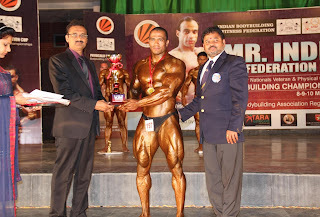 Body Builder Amit Chhetri of Uttarakhand clinched the coveted title ‘Champion of Champions’ for Federation Cup 2013’. Mr Chhetri was adjudged the best not only in his weight category from 95-100 Kgms but also over all the best in other 9 weight categories ranging in between 55 Kgs to above 100 Kgs. 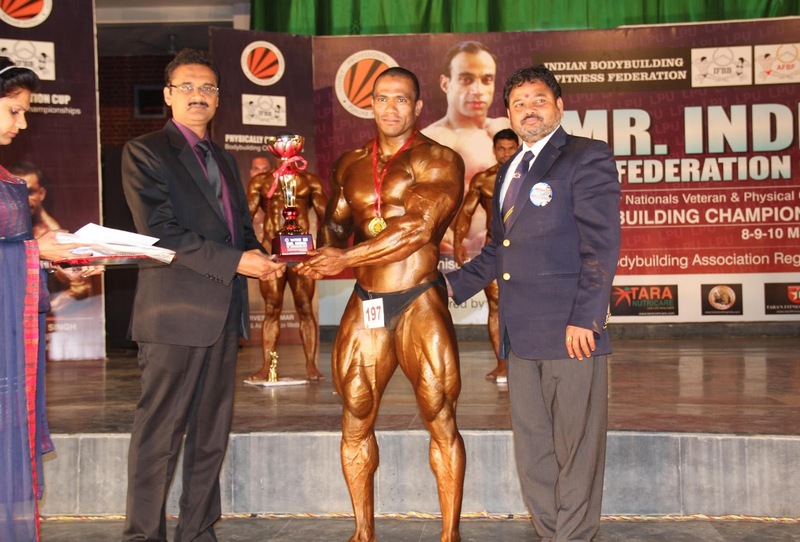 LPU in association with Punjab Amateur Body Builders Association (PABBA) organized the championship, under the aegis of Indian Fitness and Body Builders Federation (IBBF). In other competitions, Maharashtra’s Ajay Pevekar (up to 75 Kgs) got declared Champion for 51st Junior National Championship, Tamil Nadu’s K Arunachalam became Champion of Champions for Masters National Championship, and Punjab’s Sham Singh (above 60 Kgs) was declared Champion of Physically Challenged Championship. The Chief Guest of the Closing ceremony, LPU’s Chancellor Mr Ashok Mittal handed over the glittering trophies to the Champion of champions and Gold, Silver and Bronze Medals to other winners and runners -up of different 22 categories, individually. Congratulating the Champions and winners of individual categories, Mr Mittal encouraged other participants also to keep up the spirit of competition to excel: “The real aim of such organisations is always to inspire the Indian youth to realize their hidden talent. The way the two day event displayed the best of awakening towards health and physique is an example in itself. Body builders from each of the states of India have proved their abilities in the best possible way. We are sure that these players will further shine during competitions at national, Asian and International competitions to gather more and more glory for the country.” On this occasion, Mr Mittal was accompanied by Pro-Chancellor Ms Rashmi Mittal, President of PABBA, Dr Randhir Hastir and General Secretary of IFBB Mr Sanjay More. Illustrative, Maharashtra got 26 illustrious positions in different categories, whereas Punjab got 21. The other gold winners in their respective categories are: Rajan (Punjab) for up to 60 Kg in Physically Challenged; in Masters National (40-49 years age group) Rakesh Chand (Maharashtra) for up to 70 Kg in , K Arunachalam (Tamil Nadu) for above 70 Kg, and in age group of above 50years Bihari Lal ( Punjab); in 51st Junior National Vijay Dhoke (Vidarbha) for up to 55 Kg, Aju Ghosh( West Bengal) upto 60 Kg, Deepak (Delhi) up to 65 Kg, Rupesh Mirkute (Maharashtra) up to70 Kg, Pramod Kumar(Uttar Pradesh) up to 80Kg, Sumit Gulia(Delhi) above 80 Kg. The winners in their respective weight categories for Federation Cup are: Sunil Sakpal (Maharashtra) up to 55Kg, Aju Ghosh (West Bengal) up to 60Kg, Ravi Kumar (Punjab) up to 65Kg, Vishal Kumar(Punjab) up to 70Kg, Jitender Singh (Delhi) up to 80 Kg, Tejender Singh (Uttarakhand) up to85 Kg, Sumit Gulia(Delhi) up to 90Kg, and Vinay Kumar(Delhi) above 100 Kg. Another body-building championship among students will be a part of County Central High School initiative to support healthy lifestyle. Certainly, there'll be some more activities connected with education, guys that can do your essay will share tutorials how to write an essay fast. What about my maximum, I can write really great illustration essay. here you can even find advices I used.